Lobster, accented with sweet shoepeg corn, heavy cream, cilantro, a splash of lime juice, and wrapped in a masa pastry. From frozen best if deep fried at 350 ºF for 6 - 8 minutes, or if baking, brush with egg wash and bake in a 350 °F convection oven for 6 - 8 minutes or until internal temperature reaches 165 ºF as measured by use of a thermometer. Empanadas, empanadillas, and pastelitos. For centuries, this popular street cuisine has been enjoyed by countless patrons throughout Latin America and Spain. Consisting of a savory or sweet mixture, folded in a pastry, deep fried or baked, empanadas continue to gain consumers appetites. With today’s ever changing dining palette, today’s consumers are requesting for more unique and authentic ¬flavor profiles. 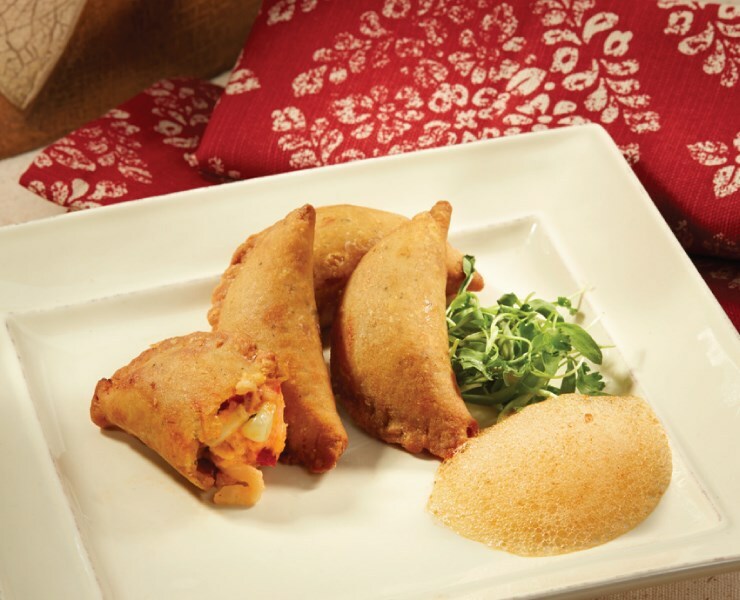 To offset these demands, Kabobs’ K7182 Lobster & Sweet Corn Empanada combines the sweet flavors of lobster and corn, paired with heavy cream, cilantro; all wrapped in a traditional corn masa pastry. Kabobs‘ Lobster & Sweet Corn Empanada is ideal as a simple passed hors d’oeuvre / appetizer, resting on a cool guacamole cream or as an accent to a shooter of pozole, or side salad. The exotic flavors of roasted garlic, ginger, cayenne pepper, cumin & real lime juice are combined for a robust rub for our chicken satay.